Today I’m pleased to announce that Hackberry Font Foundry has released Biblia, Biblia Serif, new book production fonts for my friends. This is specifically designed for my cohorts, writers and publishers of Christian fiction and non-fiction. That’s why they are named Biblia. I’m working on a companion sans named Draetha, which is Welsh for preach. These fonts have a long history. In the early nineties, I fell in love with the look of a font named Minister. I was originally told that it was an old Bible font, and I ran with that for many years. A decade ago I discovered that it was a German font from the late 1920s. As I said, this all started with a love for Minister. 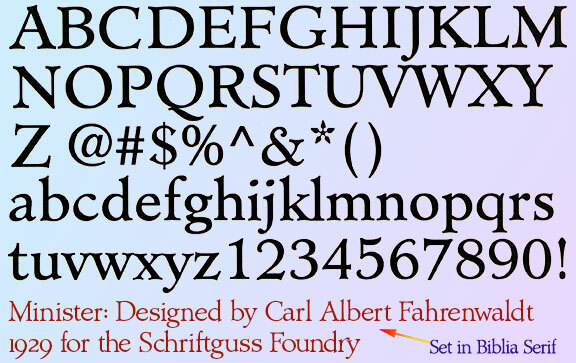 This is a font designed by Carl Albert Fahrenwaldt in 1929. To the left, there’s a scan from Linotype’s page many years ago. They no longer carry the font. I’ve gone quite a ways from the original. It was dark and a bit heavy. But I loved the look and the readability. This came to a head when I started my first book on all-digital printing, Printing In A Digital World, developed and written from 1991-1995, and published early in 1996. I needed fonts to show the typography I was talking about. At that point oldstyle figures, true small caps, and discretionary ligatures were rare. More than that, text fonts for book design had lining OR oldstyle figures, lowercase OR small caps—never both. I chose the Greek word for minister for the name. It was fairly rough. I knew very little about font design 25 years ago. I later redesigned, refined, and updated Diaconia into Bergsland Pro—released in 2004. It was still rough (though I impressed myself). Now, with 4-font Biblia Serif family 13 years later, I’ve cleaned up the glyphs, made the fonts more consistent internally, added more functional OpenType features, and brought the fonts into the 21st century. I used the 2017 set of features: small caps, small cap figures, oldstyle figures, fractions, lining figures, ligatures and discretionary ligatures. These are fonts designed for book production and work well for text or heads. Then in 2006, I found myself needing a readable sans serif. So I went to Bergsland Pro, and eliminated the serifs. I named the font Brinar. Basic taste told me to keep a flare in place for the serifs and cupped the ends. I was stunned. People loved it. It’s remained my personal bestselling font family until very recently. So, at the end of 2016, I decided that Brinar really needed some help. The flares were basically random. The stem width and modulation variances all needed to be fixed. My old OpenType feature code was quite limited and clumsy. So, I designed it into the 6-font Biblia family. I updated the these fonts also to the 2017 set of OpenType features: small caps, small cap figures, oldstyle figures, fractions, lining figures, ligatures and discretionary ligatures. These are fonts designed for book production and work well for text or heads. So, Biblia, Biblia Serif, new book production fonts for my friends. My original plan was to simply update Brinar. But, the serif version was sitting there on my computer, with the same metrics. So, I redid Biblia Serif also. They work flawlessly together. None of them have been made available by FontSpring, YouWorkForThem, MyFonts, Creative Market, or Gumroad yet. Oops! I take that back. Creative Market has them up: Biblia & Biblia Serif. Gumroad has the best prices and comes with a desktop, Web, and ePUB license.